Sir George Stanley Pott (b. 1870), son of Ven. A. Pott (Vicar of Sonning and Archdeacon of Berkshire) and Lady Pott, Clifton Hampden, Abingdon, Berkshire (daughter of Rev. Arthur Pitman) until sold by Lady Pott, in these Rooms, 27 June 1957, lot 80. With H. Blairman & Sons. Lord Samuel of Wych Cross (d. 1987), sold Sotheby's London, 17 November 1989, lot 50. Acquired by the present owner from Carlton Hobbs Ltd.
R.W. Symonds, 'Two English writing cabinets', Connoisseur, April 1958, pp. 83-87, figs. 2-11. T. Hughes, 'An Emphatic Wayward Grain', Country Life, 2 October 1975, pp. 850-852, fig. 1. Carlton Hobbs, Catalogue Number Two, 1991 (cat. no. 20). C. Gilbert and T. Murdoch, John Channon and brass-inlaid furniture 1730-1760, London, 1993, pp. 2, 59, 60, 79, fig. 45, col. pls. IV, VII. J. Cornforth, 'Top Brass Toppled', Country Life, 14 April 1994, pp. 56-59, figs. 3 and 4. Leeds, Temple Newsam House, John Channon and brass-inlaid furniture 1730-1760, 1993. This magnificent bureau-cabinet has a temple-pedimented façade in the Roman manner that was celebrated as the 'National' style in George II's reign. The 'Desk and Bookcase', known also as a 'Lady's Closet', combines the functions of the pier-set of mirror/glass and writing/dressing-table with those of the bookcase and 'commode' chest-of-drawers. Vitruvian elegance is recalled by its scrolled 'Roman' pediment and antique-fluted Composite pilasters, while its brass-enrichments and 'sarcophagus' scrolls after the Louis Quatorze manner of Andre-Charles Boulle (d. 1732), introduce the 'picturesque' Franco-Romano fashion called 'Modern' in the 1730s. An air of lightness is contributed to its interior by heroic harlequins from the Italian comedy theatre serving as delightful guardians of its secret compartments. Engraved in laurel-wreathed tablets, these truncheon-bearing police evoke the French 'Scènes de Comédie' of Antoine Watteau. Just as they symbolise 'love's secrets', so Love's Triumph provided the theme for the embellishment of the entire cabinet. Its veneer of richly-figured 'rosewood' (East Indian padouk) is ormolu-enriched with golden sacred-veil drapery guarded by 'bas-relief' medallions of acanthus-wrapped Roman heroes, symbolic of ancient virtue. Venus's sacred roses flower the graceful Ionic volutes of its triumphal-arched pediment, where a golden cartouche would have served as a Cupid's target for the owner's cypher. Love-winged Cupid is displayed in a medallion on a mosaiced tablet filigreed with a 'boulle' inlay of Roman foliage. Venus shells and festive satyr-masks symbolize the paradisical Golden Age of the poet's Arcadia, and emerge amongst Roman acanthus on the handle-plates whose fretted cartouches recall Jacques de Lajoue's 'picturesque' compositions as engraved in Gabriel Huquier's Livres de Cartouches and Tableaux d'ornamens et rocailles. The 'carrying-handle' cartouches are framed in golden ribbons and accompanied by bas-relief frets of Venus-waved and acanthus-wrapped ribbons, in the manner of the Louis Quatorze 'plats bandes' engraved in Daniel Marot's oeuvres, 1712. The bookcase interior displays a golden medallion that is boulle-inlaid with a 'JEP' cypher of Roman foliage, addorsed and entwined in the antique manner demonstrated in Benjamin Rhodes's New Book of Cyphers, issued in 1723. Cupid guards another escutcheon, inlaid in contre-partie in a gothic triumphal-arched tablet that provides the parquet for the pigeon-holed letter-tray of the bureau's 'prospect'. This serpentined and triumphal-arched 'prospect' has trussed pilasters framing its letter-tray and drawer-nests, and these are hollowed and acanthus-wrapped. They incorporate narrow drawers and are embellished with Arcadian satyr-masks that guard lock-springs concealed in their fretted inlay of acanthus-wrapped ribbons. 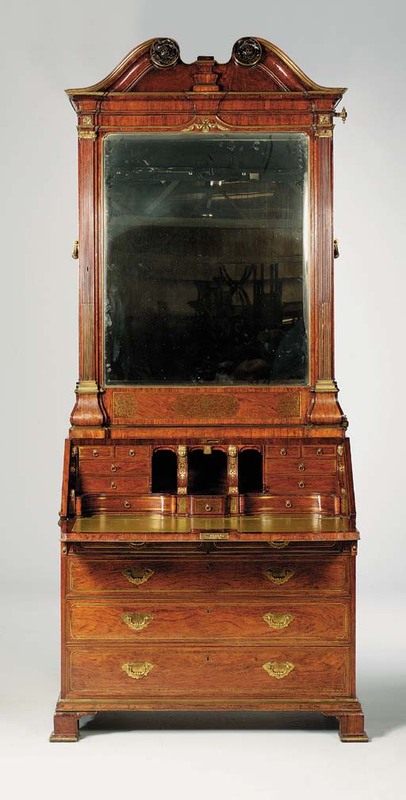 The 'prospect's' stepped plinth contains concave-fronted drawers and a convex 'ink-tray' drawer that is flowered and filigreed in 'boulle' inlay. Here the Harlequin 'masters of disguise' recall C.N. Cochin's contemporary engraving Pour garder l'honeur d'une belle, l729, and police the letter-tray's secret compartment. A nest of drawers, veneered in lozenged mosaic parquetry, is concealed behind and retained by a central brass capstan-wheel. The bureau's writing-fall likewise displays a cartouche of golden foliage, and conceals a hinged lock-cover that can be sprung by means of a button hidden beneath its book/music rest. The bureau-cabinet belongs to a group of brass-enriched furniture conceived in the French fashion that the artist William Hogarth helped promote at his St. Martin's Lane Academy in the 1730s. The study of these masterpieces of Georgian cabinet-making have focused on Hogarth's St. Martin's Lane neighbour, the 'Cabinet-Maker and Frame-Maker', John Channon (d. 1779) (see C. Gilbert and T. Murdoch, John Channon and brass-inlaid furniture 1730-1760, London, 1993 and The Dictionary of English Furniture Makers 1660-1840, Leeds, 1986, pp.155 and 156). Following London's rapid expansion westwards into Mayfair in the early l8th Century, John Channon took the opportunity to move from his family's cabinet-making business in Exeter and establish workshops in St. Martin's Lane, which was becoming the centre of England's cabinet-making industry. He was given encouragement by his Devon protégé, Sir William Courtenay, 7th Earl of Devon and 1st Viscount Courtenay (d. 1762) following his succeession to the Powderham Castle estates in Devon in 1736. 'J. Channon fecit 1740' is inscribed on brass tablets attached to a pair of arch-pedimented bookcases commissioned by the Earl for Powderham Castle. Likewise celebrating 'Love's triumph', the latter are boulle-filigreed with ornament derived from the engraved 'Oeuvres' of Jean Berain (d. 1711) and focused on the Venus 'dolphin' of Courtenay's ancient armorial crest. The execution of such 'rich and curious [fine wrought] workmanship' no doubt necessitated the engraving and inlaying skills introduced by émigré craftsmen such as Abraham Roentgen (d. 1793) of Neuweid, and other members of the Moravian and Huguenot communities. Channon is likely to have employed journeymen for such work, as did the Clerkenwell 'Cabinet-maker and Chair Maker' Giles Grendey (d.1780), who was famed as a 'Great Dealer in the Cabinet way'. Amongst related furniture and furniture designs is a collector's cabinet, displaying the Cardinal Virtues supporting its pediment cartouche, that features as a centrepiece heading for the trade-sheet issued in the 1730s by the cabinet-maker Thomas Potter (Gilbert and Murdoch, op. cit., fig. 11). A related brass-enriched cabinet, now in the Victoria & Albert Museum, has also been associated with the 'Curious [fine wrought] cabinet of casts, pastes and impressions' that belonged to Channon's St. Martin's Lane neighbour, Mr. William Hubert (d. 1740) a leading French dealer or marchand mercier patronised in the 1730s by Frederick, Prince of Wales (d. 1751) (op. cit., p. 18 and.T. Murdoch 'Hubert's Chandeliers', Country Life, 25 April 1996, p. 87). Further evidence of the 'Harlequin' bureau-cabinet having been executed in the 1730s, is provided by the date '1730' recorded on a closely related bureau-cabinet bearing a label with the inscription 'Antrobus Fecit'. On this evidence the present lot was ascribed to the previously unrecorded cabinet-maker, Antrobus, in the exhibition at Temple Newsam House in 1993 (see C. Gilbert, The Pictorial Dictionary of Marked London Furniture l700-l840, Leeds, 1996, figs. 23 and 24 and J. Cornforth, 'Top Brass Toppled', Country Life, 14 April 1994, pp. 56-59).